ISLAMABAD: The State Bank of Pakistan (SBP) to be given operation and institutional independence for bringing discipline in money market. 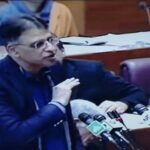 According to ‘Medium-Term Economic Framework’ launched by Finance Minister Asad Umar on Monday, the government is considering giving the SBP greater operation and institutional independence to bring greater discipline in money market and exchange rate regimes. It said that the State Bank Act would be amended to further strengthen the autonomy of SBP and clarify its objectives and functions. “Specifically, the government, in consultation with SBP and other stakeholders, will finalize proposals to facilitate implementation of flexible inflation targeting as envisage in SBP Vision 2020,” it added. The existing exchange rate arrangements and possible limits of government borrowing from SBP will also be clarified in line with prioritizing price stability as an objective of monetary policy. The framework said that the exchange rate is one of the most important prices and is determined by underlying economic fundamentals. These fundamentals ensure that it would adjust to its equilibrium value over the long run. As mentioned earlier, Pakistan’s approach over the last two years to manage the exchange rate was structurally flawed, as it focused more on the overriding desire to avoid unnecessary volatility in the foreign exchange market and avoid fiscal cost of exchange rate adjustment, even when it was needed. The recent pressures on external fronts are a manifestation of the misaligned exchange rate for the past two years. Against this background, the principal idea now is to enshrine an exchange rate policy which enhances competitive of Pakistani exports, by avoiding the persistent overvaluation of rupee. Accordingly, the Pakistani rupee has depreciated around 33.4 percent since November 2017. The depreciation has moved the exchange rate to a level, which is more reflective of economy’s medium-term needs and market conditions while at the same time minimizing disorderly fluctuations. The near-term goal of this policy is to move towards an exchange rate regime which SOEs not allow overvaluation of rupee on persistent basis.